Join me for my 4th time teaching in Creative JumpStart, run by Nathalie Kalbach. You get 31 inspiring downloadable video lessons from 31 teachers​ every day in January. It's only $60 for the month - just $1.94 a lesson! You can also check out my video interview with Nathalie to the right to learn more about me and my thoughts on this year's theme, "My Home is My Castle." My first online class, "Boho Grunge," is now available from StencilGirl Studio! In this course, we'll walk through the creation of a mixed media panel in my signature Boho Grunge style from start to finish. This was not a pre-planned project, so you get to see my organic process! I'll show you everything from how I created the background and integrated my collage layers to stenciling techniques, selecting elements and assembling the focal point, and even how I make different metals look the same and add a faux-rust effect. You can check out the intro videos for free, or register now and jump right in. You can learn more about my class and the project we'll be making in the video above. 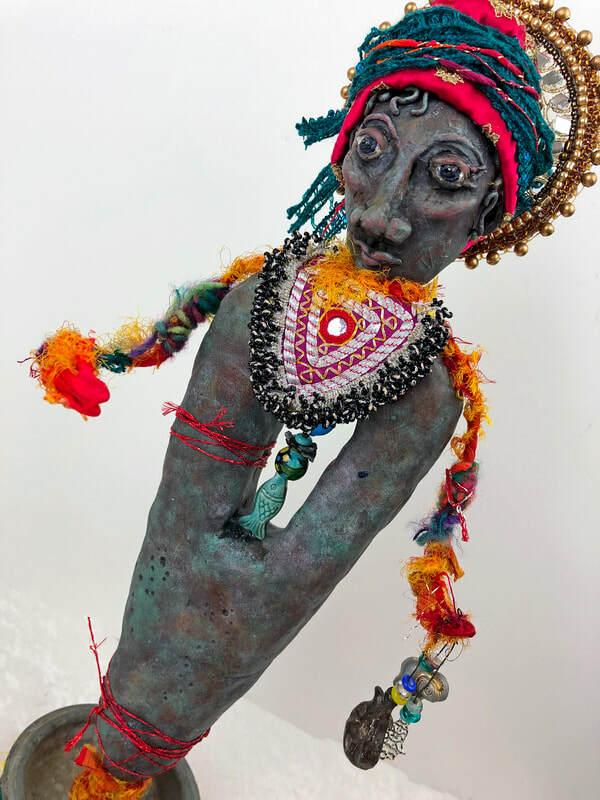 My workshop is over 120 minutes of tightly edited instruction where we'll make this fabulous Spirit-Totem doll. I'm excited to share that I'm an instructor in a year-long art retreat called "Art Walk Alchemy." The theme for the year is Totems and Talismans — those ideas, objects, and emblems that represent something significant in our lives. Each month you'll receive two lessons (24 total,) each with at least 1-1/2 hours of video, from two different professional artists... 24 in total! I'm currently booking my 2019 workshop schedule, (and even a few in 2020!) so if you're interested in having me come teach, shoot me an email. Register for "Tinker, Tailor, Artist, Maker"
Class is full - second date added on Thursday, 6/20. Check out my available half-day and full-day in-person classes. Fill out the form to the right or shoot me a message if you have any questions or are interested in scheduling a workshop. Please note that I prefer to not offer classes on Sundays. Gwen's classes are so well planned. Her class projects are structured to maximize the the time in class as she incorporates multiple techniques, the proper use of tools, and detailed product information. I always have fun in her classes and leave with a wealth of information. She is a great person and extremely talented artist. Gwen's style and flair for the exotic always makes for an exciting class... a fusion of Bohemian & Asian with a gilded finale, her art is filled with echos of her travels. Gwen is happy to share her tips, tricks and techniques with all her students. You will leave class inspired!